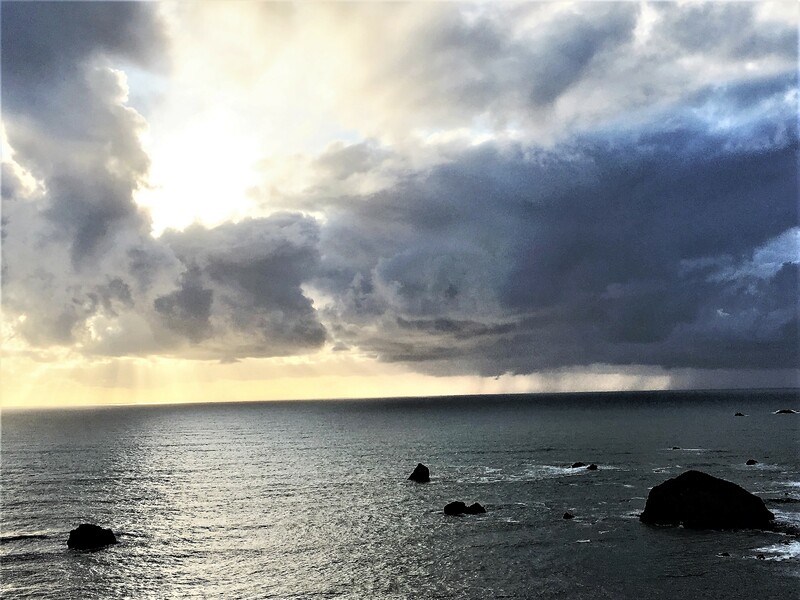 The winter months are a good time to finish narrating (and remembering…) our three and one-half day journey down the southern Oregon coast and through the beautiful Redwoods as far as Eureka in mid-September. Beautiful scenery in the state parks, some great hikes and twelve breweries, one bar (and a bottle shop) in which we raised a shared-mug (most times) along the way made it a trip to remember. 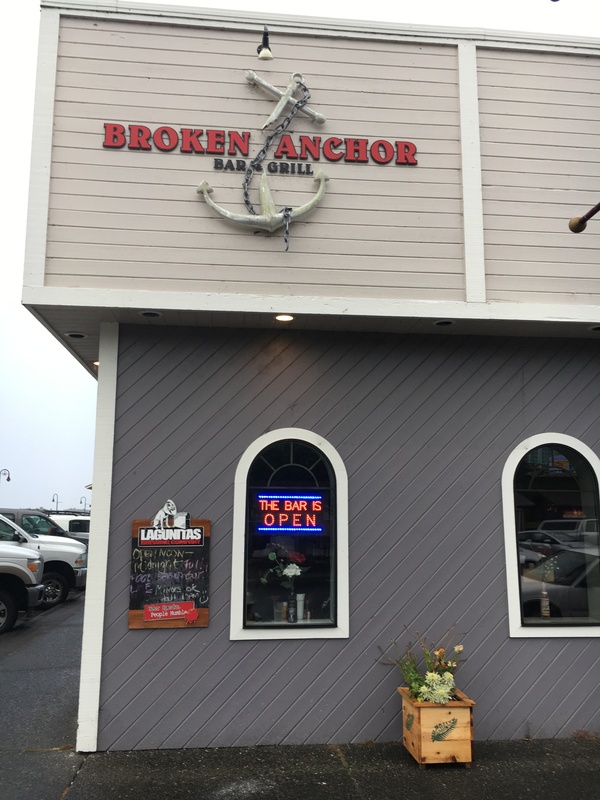 We left off the last post telling you about the personable and entrepreneurial owner of the Broken Anchor Bar and Grill in Bandon where we stayed our first night. We enjoyed outstanding food, a good tap list and our conversation with Jessica Neal. We were sorry to hear that shortly after our trip, she ran into a few strokes of bad luck with both a fire which destroyed her liquor inventory and her walk-in freezer malfunctioning – the latter resulting in a significant loss not covered by insurance. Jessica – bouncing back from bad luck…. Not surprisingly, in a recent phone call to see how she had recovered, she was upbeat and positive. Jessica was enthused about moving forward into the holidays and thankful for her loyal customers. 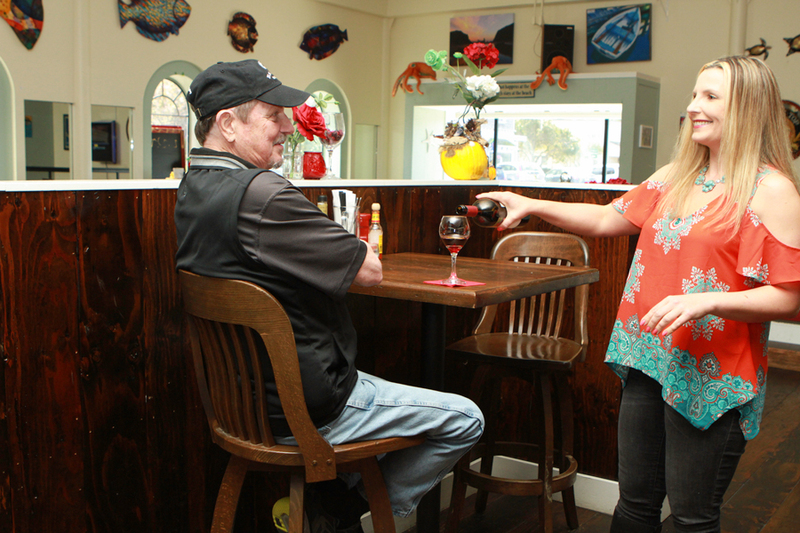 When you are in Bandon, you should stop at this quality bar, partake of the great food and say hello to Jessica. 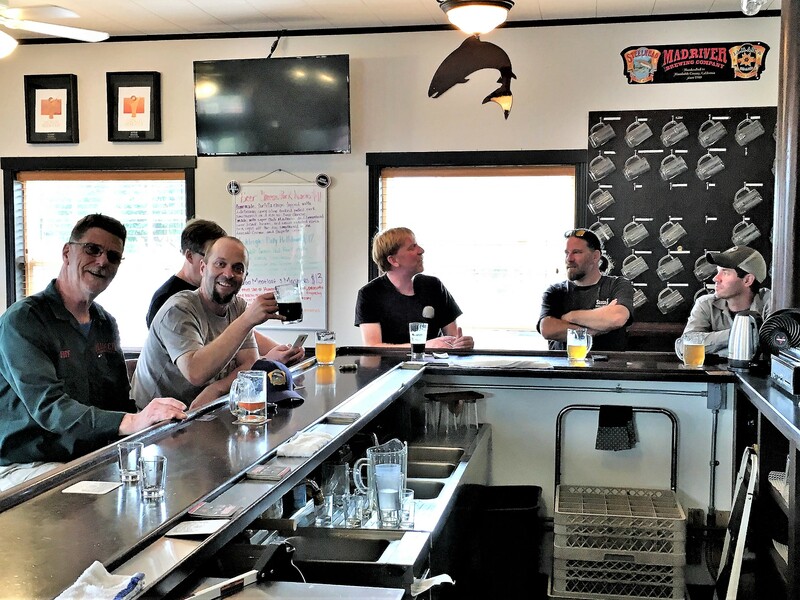 This is a long post although it is hard to be concise when visiting so many quality breweries and witnessing the beautiful scenery. But to see our favorite brewery of the entire trip, you have to either read or move down to the end of this post. 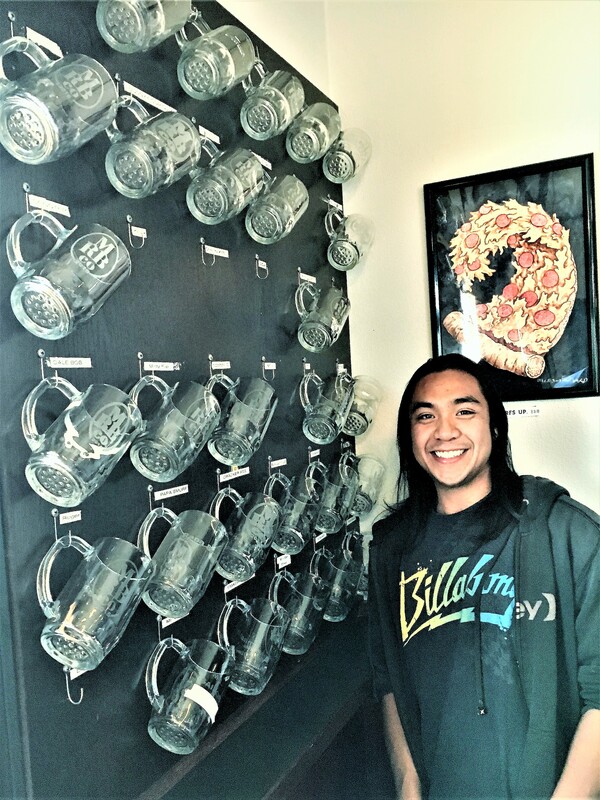 Here’s a picture of their taproom and if you are in Northern California, stop and visit this wonderful brewery. What Tap Room is this? 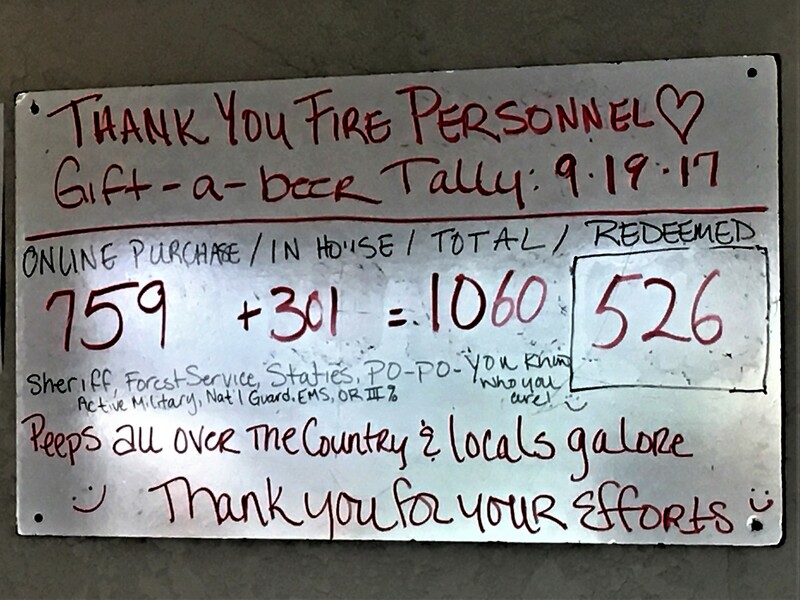 The community had been decimated by the Chetco Bar Fire, which was started by lightning in July and burned almost 200,000 acres before it was contained, including severely damaging one of Oregon’s last redwood groves. Businesses in that area including the brewery, were severely stressed by the haze and distinct possibility of evacuation during the zenith of the tourist season. 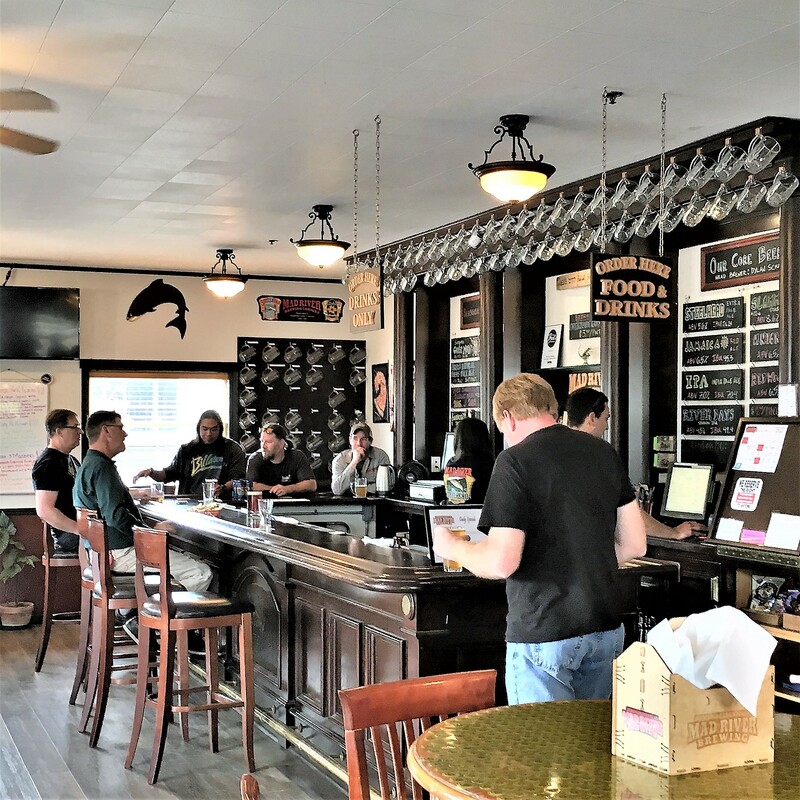 Just visiting the brewery’s small taproom with sixteen of their own vegan beers on tap, however, gave an indication how the community rallied. 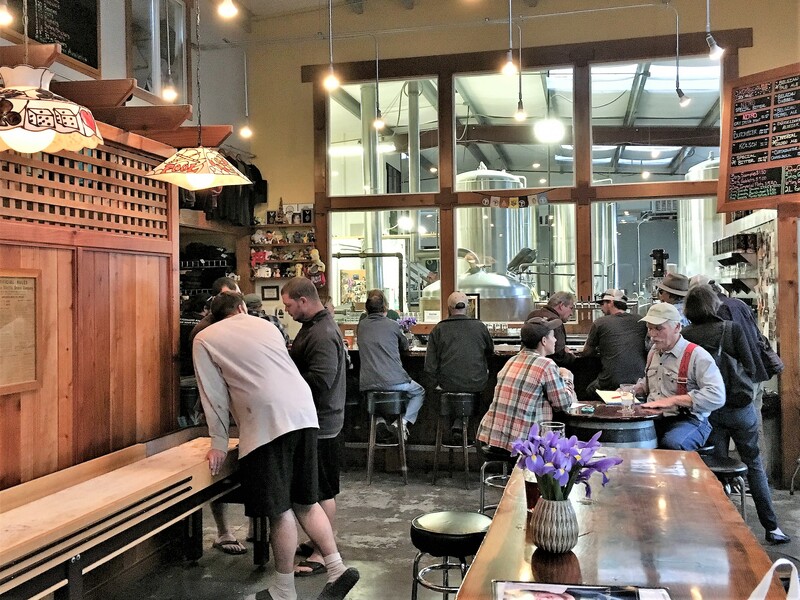 Chetco Taproom – not fancy, but a community gathering place. And it is not surprising to see how this enterprise is thriving. 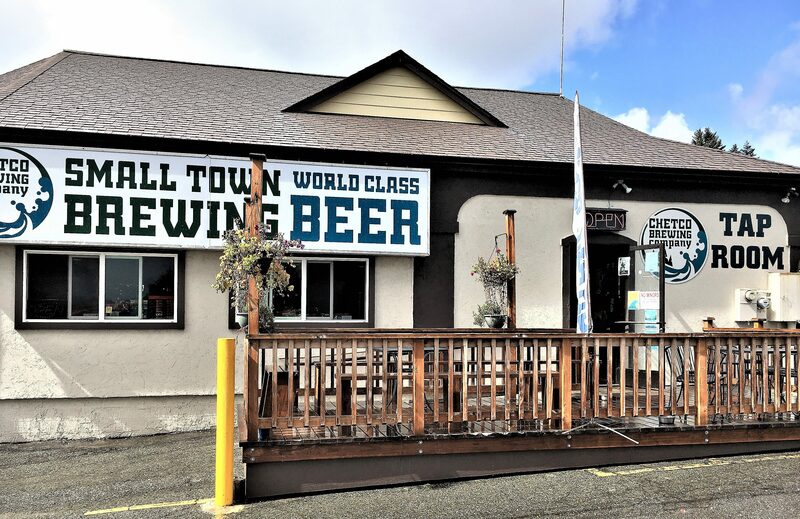 Their website gives the story entitled, “Much to be Thankful For.” It relates how they are “revitalizing” a much bigger building down the highway and moving the taproom and brewery in a project that will be incrementally completed next March. 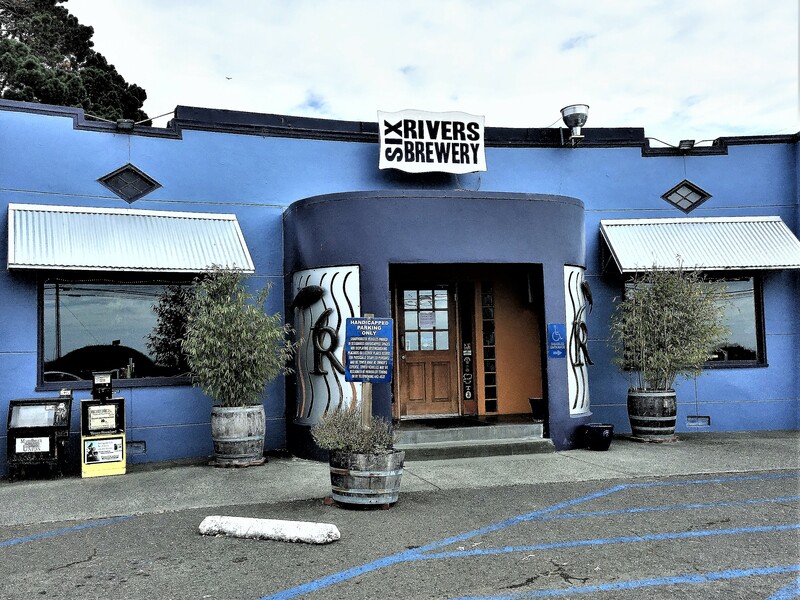 Just over the California border, we made a short stop at Six Rivers Brewery in McKinleyville. 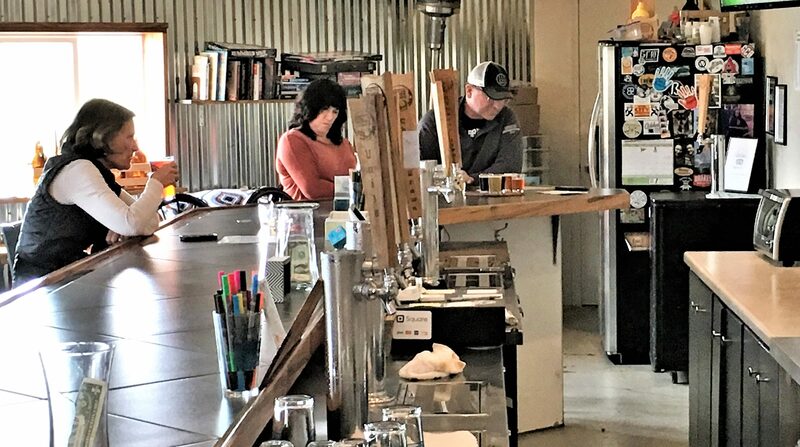 The “Brew with a View” – overlooking the Pacific on Hghway 101, opened in 2008 by Talia and Meredith became the second all-woman-owned brewery in California and has also expanded with success. The pub has a good menu and eleven of their beers on tap. 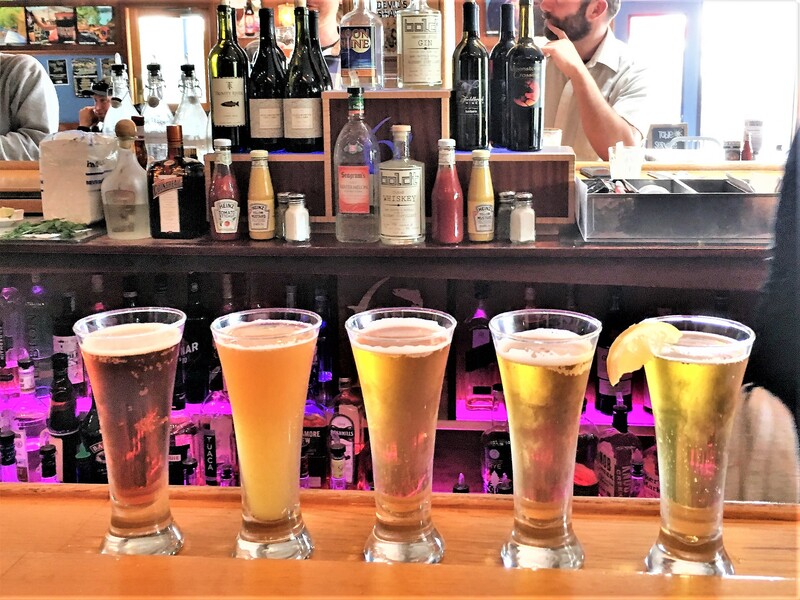 We shared a half-flight of five 4-ounce samples for only $6 after our helpful servers, Erin and Rebecca let us sample a few to narrow our choices and especially enjoyed their Bluff Creek Pale Ale. 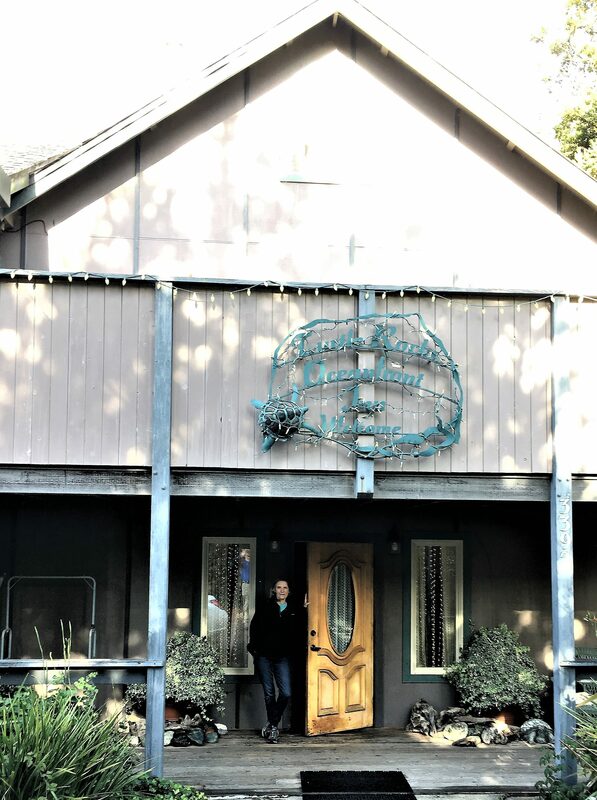 Another quick stop in McKinleyville was on the agenda. 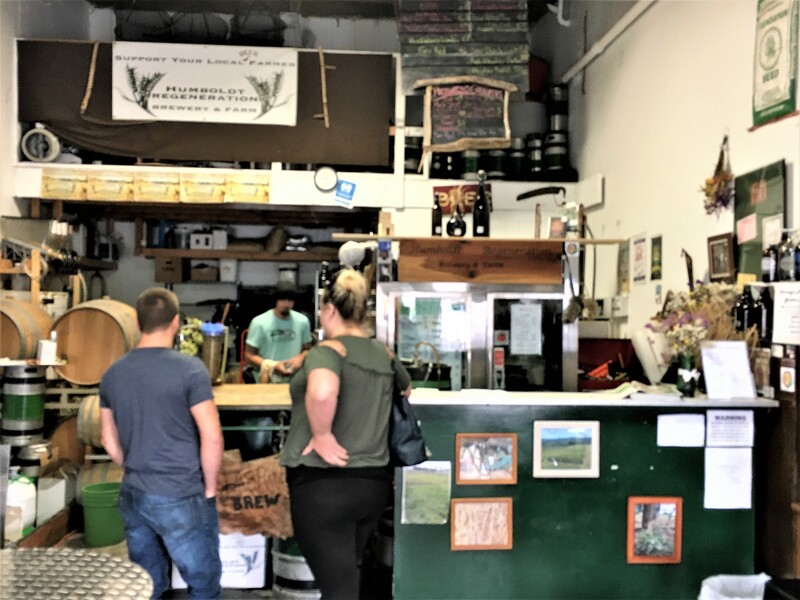 The taproom is essentially a small square room in a storage shed, but we wanted to see Humboldt Rengeration, because of its innovative and sustainable approach to brewing as evidenced by the three quotes below – the first from their webpage and the second two from Yelp. We had a nice chat with Jacob the brewmaster and shared a good Whiskey Barrel Pilsner. 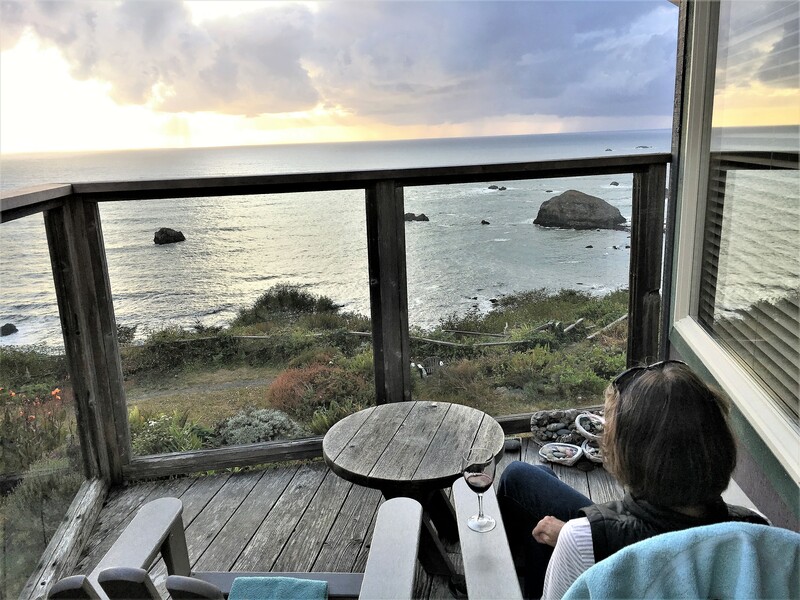 That night we stayed in Trinidad, California at the Turtle Rocks Inn, a picturesque bed and breakfast where we sat on our private deck and enjoyed a beautiful sunset dinner while listening to the sea lions bark on the rocks below. One of the joys of road trips is discovering places off the beaten path – and there are many on the coast. 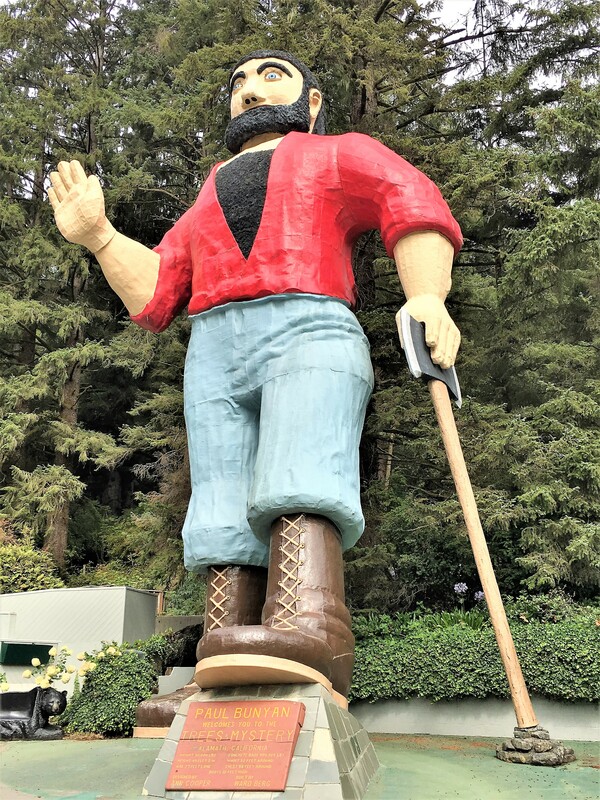 Lest you think this trip was only about beer, the next day was our favorite – a day spent touring and hiking in Redwood National Park. 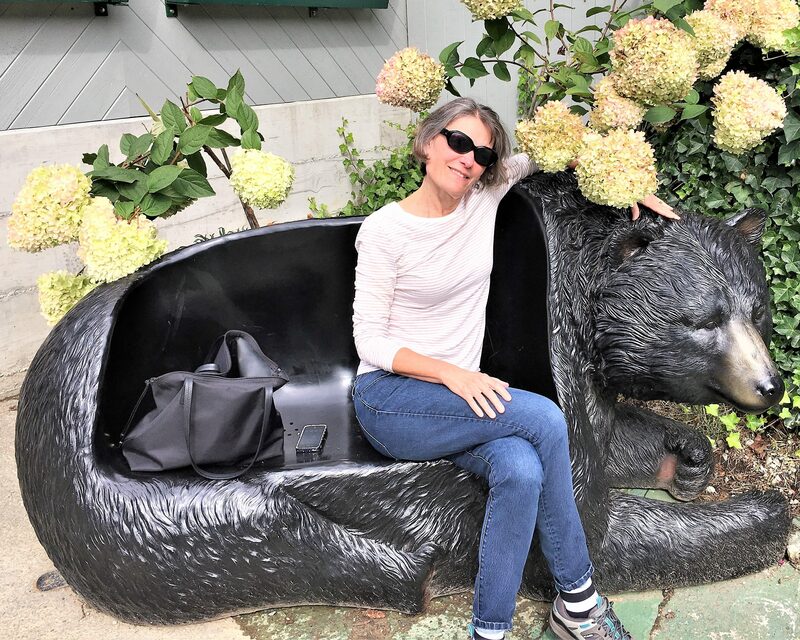 A hike through the Lady Bird Johnson grove led by a Forest Service ranger, giving the history and interesting facts about the flora and fauna made this a highlight of the trip. John Steinbeck’s quote on the Redwoods cannot help but ring true when you are standing in this magnificent grove gazing up at these trees which often grow over 300 feet and are hundreds of years old – the oldest purportedly were saplings before the birth of Christ. 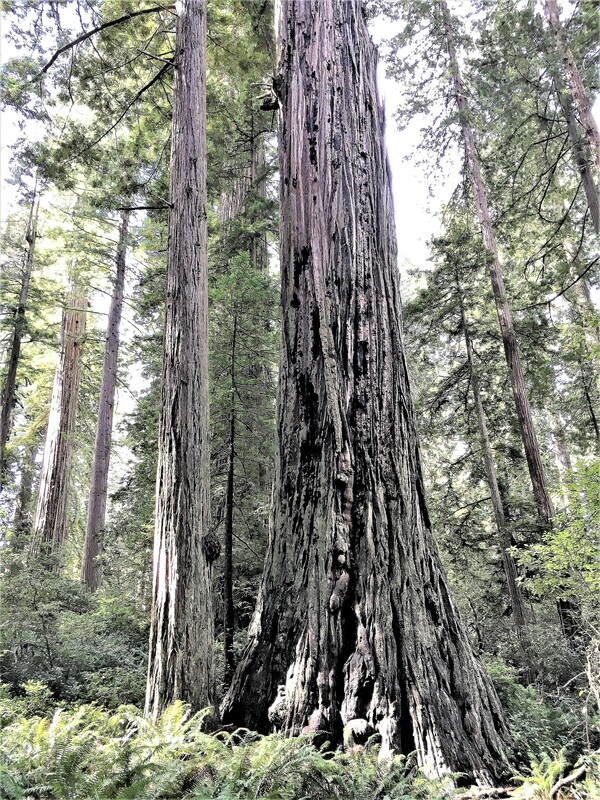 ““The redwoods, once seen, leave a mark or create a vision that stays with you always. No one has ever successfully painted or photographed a redwood tree. The feeling they produce is not transferable. 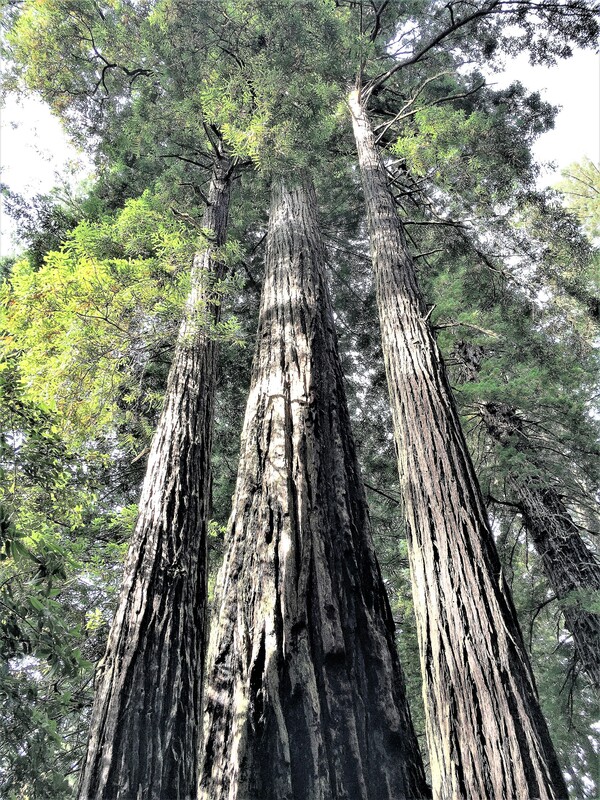 And fortunately, because of bi-partisan effort evidenced in that very spot when President Richard Nixon dedicated the park in 1969 and named the grove after Lady Bird Johnson – wife of his predecessor of the other political party – the Redwoods were saved from developers although many of the massive trees were logged before protection through park designation. Keep this in mind and realize the current “occupant” of the White House on December 4th proudly announced in Salt Lake City that he was drastically scaling back two national monuments (Baby Ears and Grand Staircase-Escalante) established in Utah by his Democratic predecessors. It was the largest reduction of public-lands protection in U.S. history. I guess when Nixon’s legacy (and demeanor) start appearing to be positive from a relative perspective, it is understandable why even blogs about bars and breweries have to digress (or regress) to political commentary to vent righteous indignation and disgust. 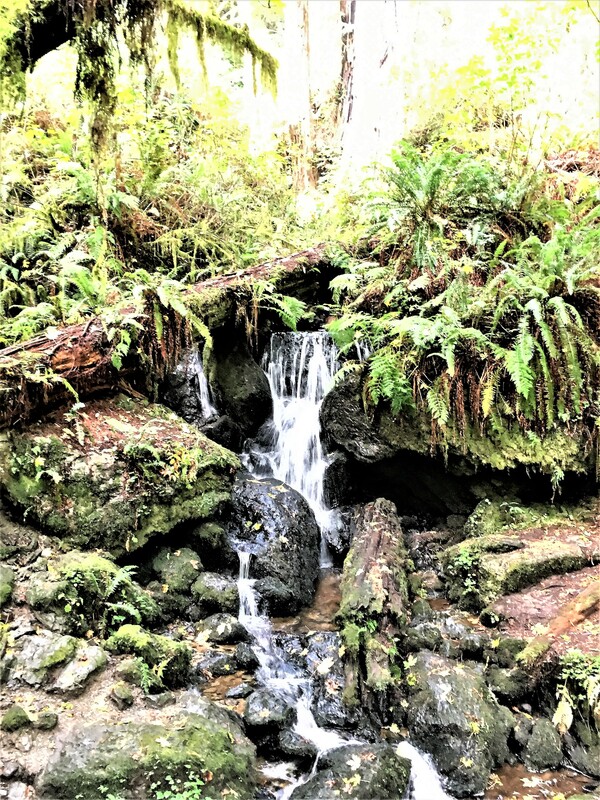 We finished that day with the Trillium Falls trail – a wonderful 3-mile loop through more majestic old-growth timber. 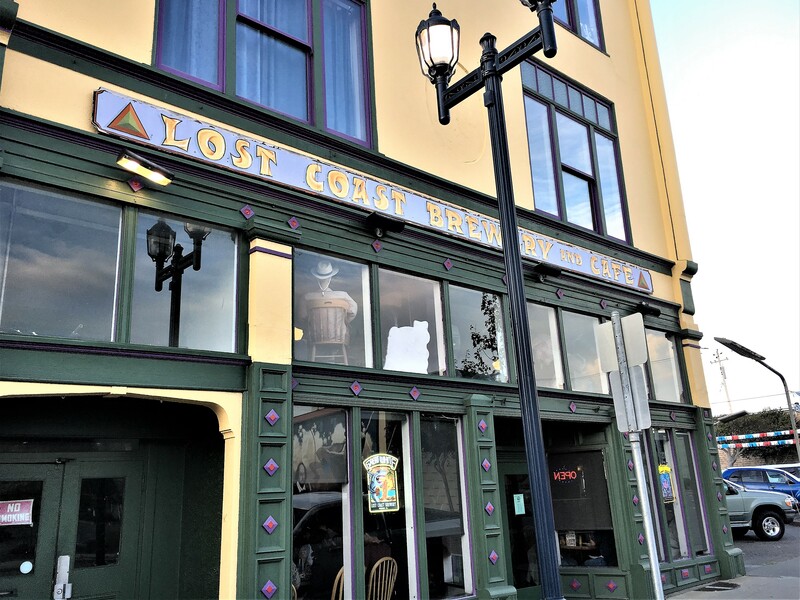 For dinner, we drove down to Eureka where we dined at the Lost Coast Brewery Restaurant, located in a 100-year old building in the heart of the city. It’s another brewery started by a woman, Barbara Groom, and has grown and expanded to become the largest brewery we visited on our trip. The restaurant was packed and has an expansive menu. Janet had their flagship beer, the Great White – their original and a Belgian-style white, while I had the Tangerine Wheat. 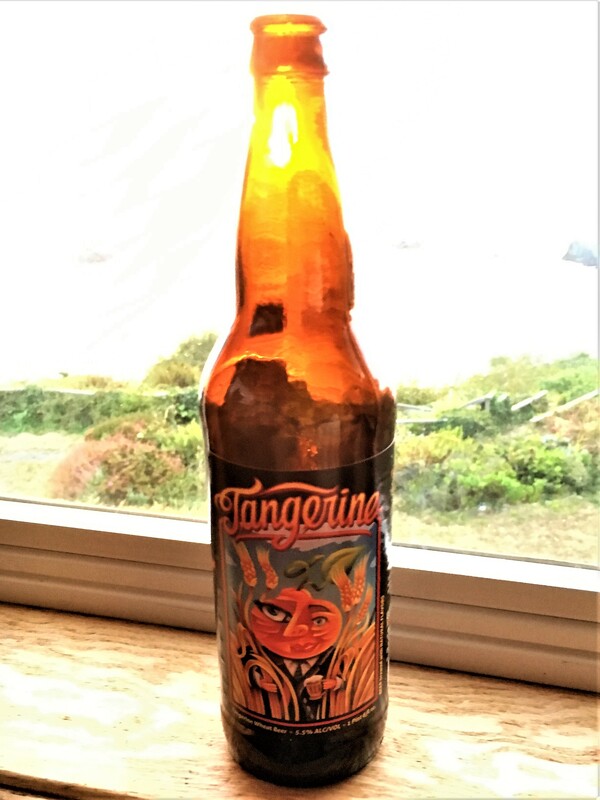 We sampled this good beer on a trip a few years back and liked it so well, we stopped at a bottle shop and brought a six-pack home. The Lost Coast logo and artwork is wonderfully creative and distinct. 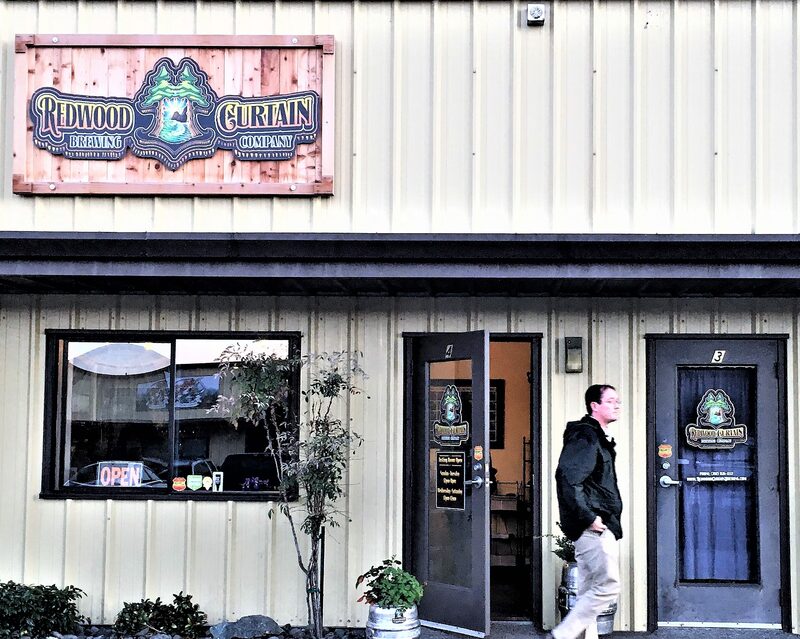 Redwood Curtain Brewing – another unimpressive location – brewery and tasting room in a non-descript strip mall, but an impressive selection of beers on tap (24 of their own beers) in a nice tasting room. 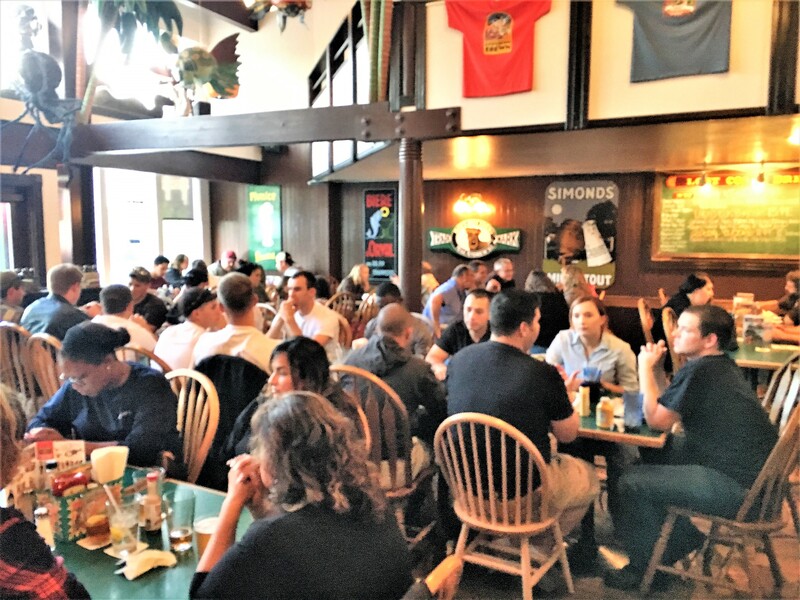 It was a Friday night and overflowing with students from nearby Humboldt State College, anticipating the live entertainment. 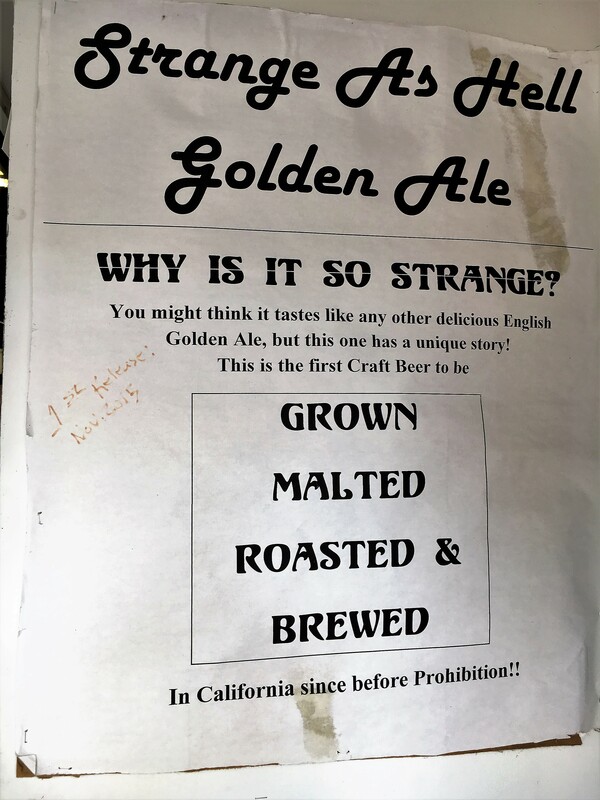 Chris, the friendly bartender, gave us a good recommendation – their flagship Golden Ale. We were going to stay for dinner, but Chris told us that a semi-truck had recently wiped out their food cart in the parking lot…..! 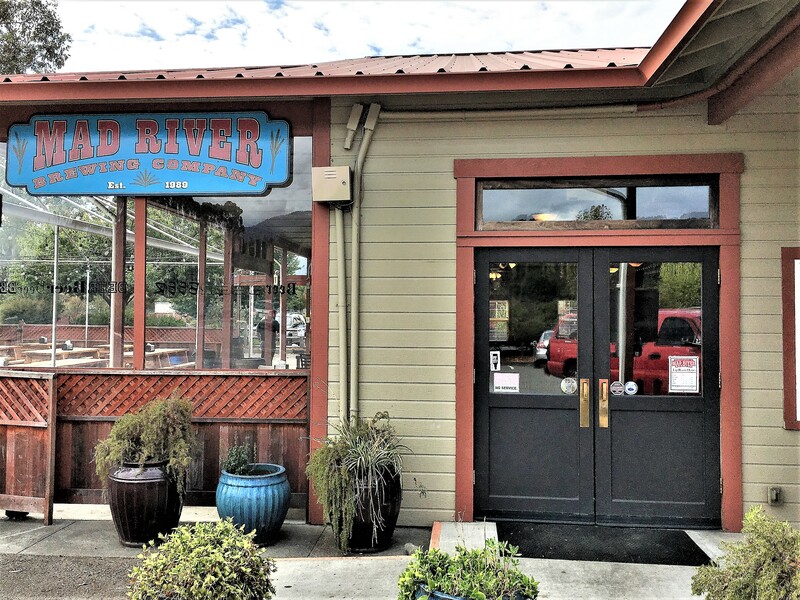 Mad River Brewery – okay, I told you I saved the best for last. 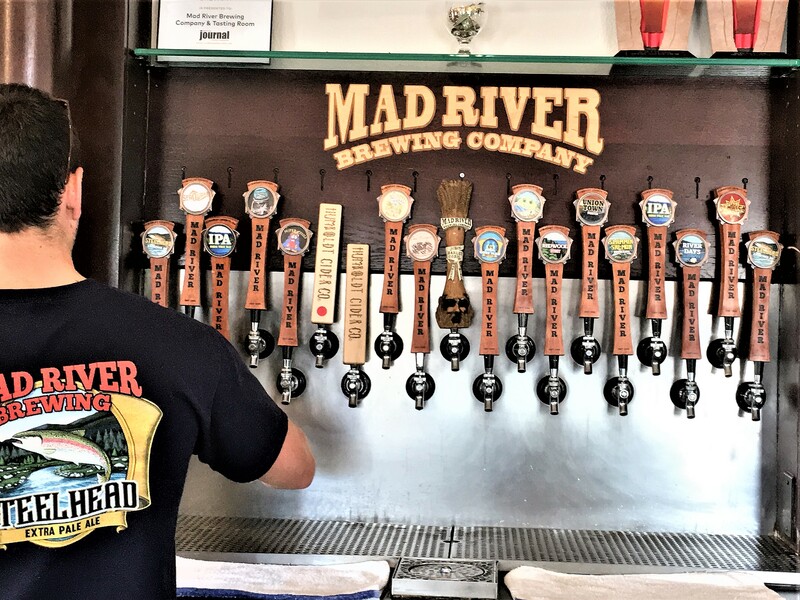 We tasted a lot of excellent beer and met wonderful people in breweries down the coast into Northern California, but our favorite in either state by far — Mad River. Was it the charming and well-designed tasting room and patio? Or was it the great logo and artwork on their bottles? That was part of it, but we loved their beer – stopped and picked up a half-case to take home – and the staff we met that afternoon, that distinguished them. 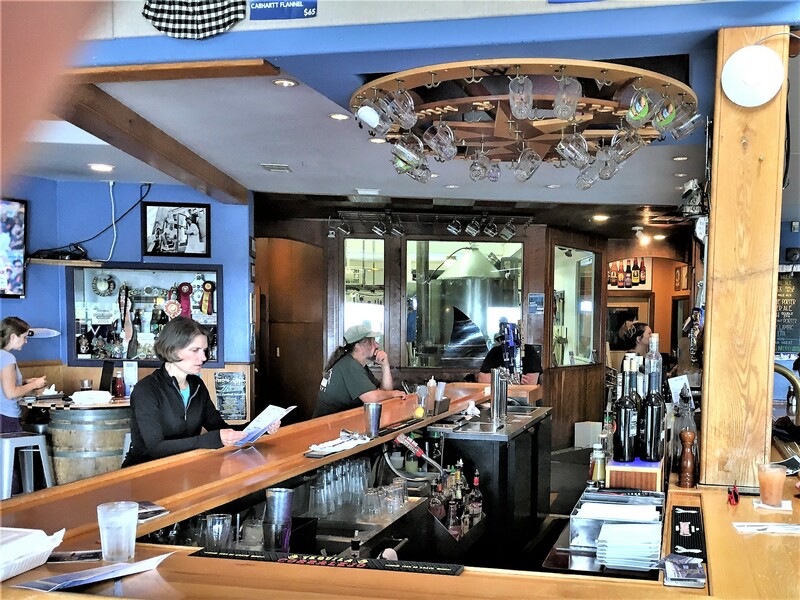 And perhaps we hit the Taproom at just the right time – there were six employees sitting at the bar after they had finished their work day and were enjoying a fringe benefit – an after-shift beer with their personal mug – each one hanging on a prominent display to the side of the bar – a creative and positive gesture by management. And our half-case was a variety pack because we couldn’t decide on our favorite. 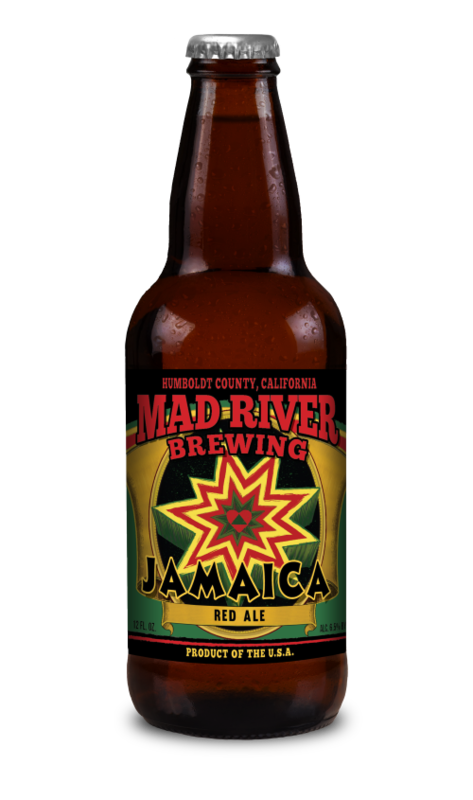 We especially enjoyed the Steelhead Extra Pale Ale, the Mad River IPA and the Jamaica Red Ale was one of the best I’ve tasted and lived up to its 2011 Silver Medal at the Great American Beer Festival. You could also get a delicious burger or sandwich in the taproom. Well, early the next morning, we left and made the long drive to our beach house in Lincoln City, but of course, we made one stop that harkened both of us back to family vacations before we hit our teens. 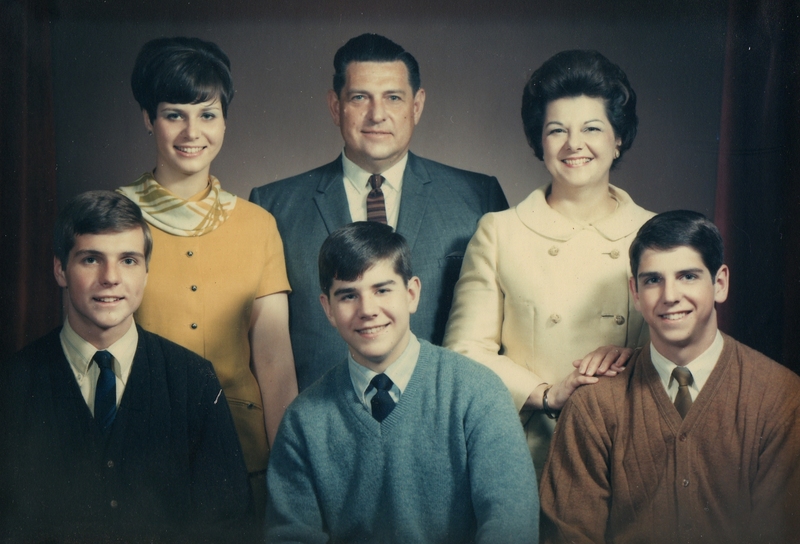 In fact, with me, it was when our family made a 6,500 three-month camping trip in the summer and fall of 1962. 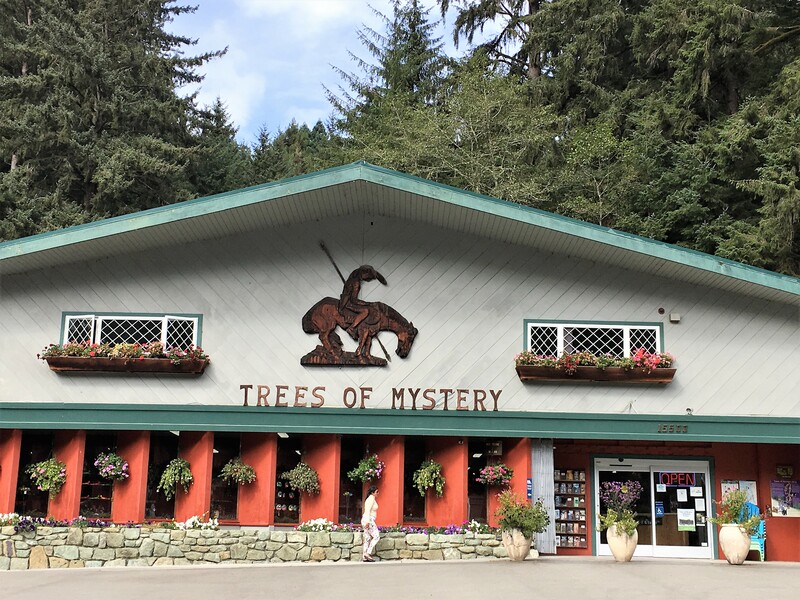 And just like Janet, I remember the Trees of Mystery on 101 although they now don’t have the guy who sat hidden in the bottom of the giant logger and fascinated young kids by talking to each one personally when they came up for a picture.